Thursday’s news was filled with reports of a supposed Israeli bombing of a weapons depot of weapons near a Syrian airport. The weapons were supposedly meant for the terrorist group Hezbollah (supposedly because as is its practice Israel refused to confirm or deny the attack). Either way, this bombing is inconsequential compared to an IAF bombing in 2007 which saved the world from dealing with a nuclear Syria. A few weeks again Syrian tyrant Assad used chemical weapons against his own innocent men, women and kids, President Trump enforced the Obama red line that Obama never enforced, and launched 59 cruise missiles at the Assad airbase that launched the chemical attack. It was just after midnight when the 69th Squadron of Israeli F15Is crossed the Syrian coast-line. On the ground, Syria’s formidable air defenses went dead. An audacious raid on a Syrian target 50 miles from the Iraqi border was under way. At a rendezvous point on the ground, a Shaldag air force commando team was waiting to direct their laser beams at the target for the approaching jets. The team had arrived a day earlier, taking up position near a large underground depot. Soon the bunkers were in flames.Ten days after the jets reached home, their mission was the focus of intense speculation this weekend amid claims that Israel believed it had destroyed a cache of nuclear materials from North Korea.The Israeli government was not saying. “The security sources and IDF [Israeli Defence Forces] soldiers are demonstrating unusual courage,” said Ehud Olmert, the prime minister. “We naturally cannot always show the public our cards. The Syrian envoy disclosed the nature of the target during a meeting of a UN committee where Israeli envoys were also present. A senior source in the Foreign Ministry confirmed that the statement was made in New York by the Syrian official. Since first announcing on September 6 that an incursion into Syrian airspace by IAF jets took place, Syria has attempted to strike a balance between mustering international condemnation of Israel on the one hand and efforts by Damascus to blur the nature and purpose of the facility attacked on the other hand. In other words, they kept telling different stories of what really happened. This is how the Syrian version of the attack evolved. 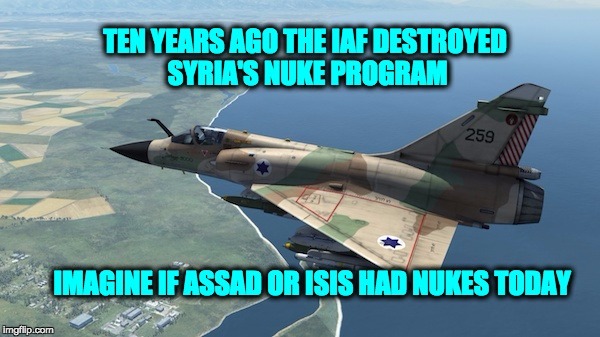 First they said that the IAF dropped a fuel tank in the Syrian desert, then Israel bombed a strategic location, followed by a claim they bombed a warehouse, eventually Syria announced that there was NO Raid. At some point Assad’s media blamed the US for the attacks, and the last thing they said the IDF bombed nothing important, just a construction site. Syria had almost as many false claims about what happened in the middle of the Syrian desert as Democrats have for Trump winning the Presidential election. Syria has a rudimentary declared nuclear program revolving around research and the production of isotopes for medical and agricultural uses, using a small, 27-kilowatt reactor, and the uranium traces might have originated from there and inadvertently been carried to the bombed site. But taken together, the uranium and the other components found on the environmental swipes “tell a story” worth investigating, said the diplomat. (…) The U.S. says the facility hit by Israeli warplanes more than a year ago was a nearly completed reactor that — when online — could produce plutonium, a pathway to nuclear arms. In other words if Israel didn’t strike Syria in 2007 Assad might have had a nuclear arsenal today. Or even worse— because the area where the Dier el Zur facility was is controlled by ISIS today. The brutal terrorist group could have had their murderous hands on the nuclear weapons. Additionally the Syrian mission illustrates the difference between the Bush administration who blessed the IAF mission in Syria and the Obama administration, which not only prevented Israel from wiping out the Iranian nuclear facilities, but signed an agreement which guarantees that Iran will be able to develop nukes within ten years (and that’s if they don’t cheat). In 1981 the tiny nation of Israel executed a military plan that was roundly criticized across the world (including the United States). It was only with the hindsight of history that we can now say that Menachem Begin’s decision to bomb an Iraqi nuclear reactor may have saved the world from a Sadaam Hussein with nuclear weapons. The bombing of the Syrian nuclear facility in 2007 like that of Iran in 1981 prevented a despot from acquiring nuclear weapons. And if Barack Obama hadn’t threatened to shoot down IAF planes if they attempted to attack Iran’s nuclear facilities, the despotic Iranian mullahs who rule the rogue regime would no longer be a threat to the Sunni Muslim nations, Israel, and of course the “Big Satan,” the United States.